Here is a list of upcoming tryouts for girls hockey teams around the state of Florida. May 4, 2019 @ Clearwater Ice Arena - Tampa Bay Lighting - Lightning Made Girls 12U and 14U teams that will compete in the SFHL for 2019-20 season. 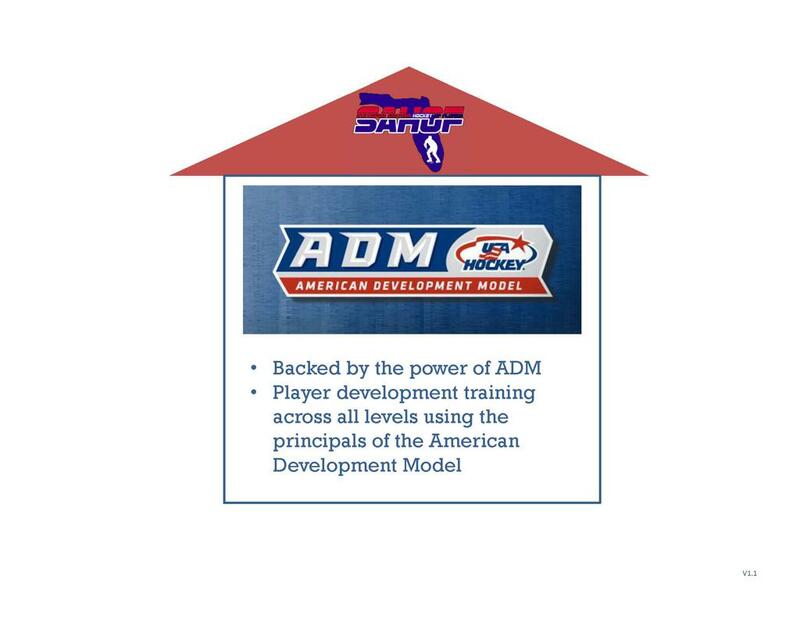 May 5, 2019 @ AdventHealth Center Ice in Wesley Chapel - Saddlebrook Girls 14U, 16U and 19U elite/national bound teams. One ice session and player/parent meeting. 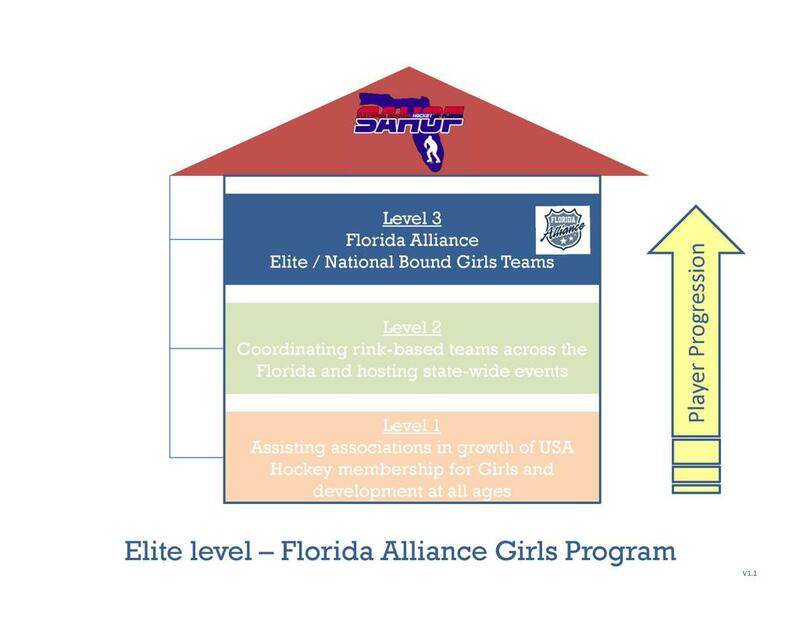 April 13, 2019 @ Palm Beach Skate Zone - Florida Alliance Girls 12U elte, 14U national bound, 16U national bound and 19U national bound teams. The Alliance will also have a tournament team at 17U level that will compete in several college showcases. Members from that team will come from their 19U, 16U and potentially 14U national bound teams. Two ice sessions and parent meeting included. The Florida Alliance Girls 16U and 14U teams capped off the inaugural season with an appearance at USA Hockey National Championships in Amherst, NY the weekend of April 5-8. Both teams advanced after capturing the first place banners at the Southeastern District Championships in March. The 16U team faced strong competition at Nationals falling to the Baldwin/RIverfalls Black Cats 4-1, perennial powerhouse Kensington Valley 1-0 and then narrowly dropping an overtime decision to the Jr Flyers 2-1. Goalie Adelyne Olson stood tall with a solid 93.6 save percentage and Forward Maddie Pope scored both goals for the Alliance 16U team. The 14U team, favorites to advance past the round robin games, did just that with wins over the Alaska AllStars 3-1, blanking St Clair Shores 5-0 and crushing Norfolk-Norwood 10-4. They continued their winning with a 6-1 polishing off of the Carolina Jr Hurricanes in the quarterfinal game. They ran into a tough Boston Jr Eagles team who proved too difficult, dropping the semi-final game 4-3. Down 3-1 starting the 3rd period, the Alliance 14u team drew close, scoring 2 goals in less than a minute late in the period, but couldn't register the game-tying goal. Alexis Fitzsimmons buried her 3rd for her third hat-trick of the weekend on that last goal. Goalies Danielle DePascquale and Mikayla Bowman each notched 2 wins leading up to the final game. Jordan Ray was the assist leader for the entire 14U division going into the final game with 16 assists and added 2 goals to score 18 points, while Alexis Fitzsimmons, not only led the Alliance with 16 goals (2 assists), but also led the 14U division in goals going into the championship game. Bryn Prier also buried 4 goals and 9 assists while Zoe Puc scored 6 points with 3 goals and 3 assists. Overall, it was a very solid showing for the Alliance Girls program at Nationals. The Alliance Girls want to congratulate the Alliance Boys 14U Tier 1 team on their strong showing at Nationals as well and Championship game appearance in Pittsburgh against Little Caesars. Florida Hospital Center Ice in Wesley Chapel will be host to the inaugural Mrs Hockey Invitational showcase for elite 12U teams. The showcase will take place over MLK weekend (Jan 18-21 ,2019). Legacy Sports developed this showcase in honor of Colleen Howe, the late wife of hockey legend Gordie Howe and in recognition for all she meant to hockey. Elite girls 12U teams from across the US, Canada and Europe are planned to attend. The Florida Alliance Girls 12U team will serve as the host team for this prestigious tournament. Florida Girls Hockey and our Florida Alliance Girls teams were formally unveiled at the 2018 SAHOF Board and Annual Meeting. Since then, our program directors have been hitting the road to explain and answer questions about this program and to accept volunteers to support various aspects of the program. May 12 - Florida GIrls Hockey was first presented to the parents and players attending the tryout session for the Florida Alliance Girls 14/16/19U tryouts at Ellenton Ice Complex. 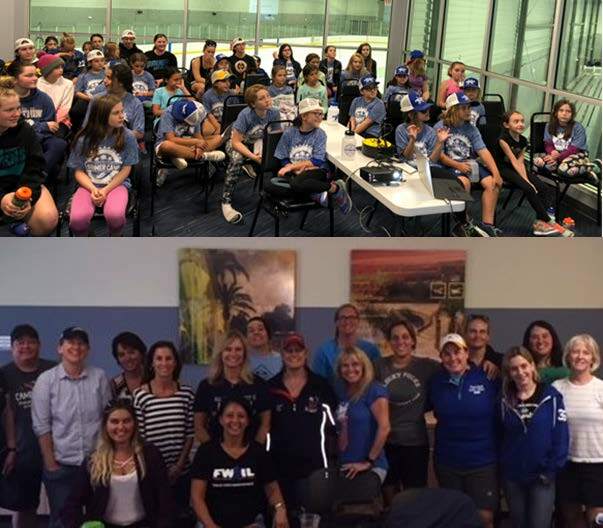 June 13 - we were invited to present to 44 girls at a classroom session at the Tampa Bay Lightning's Lighting Made girls hockey clinic at Florida Hospital Center Ice in Wesley Chapel. This was the first girls-only several day clinic in their program's history. 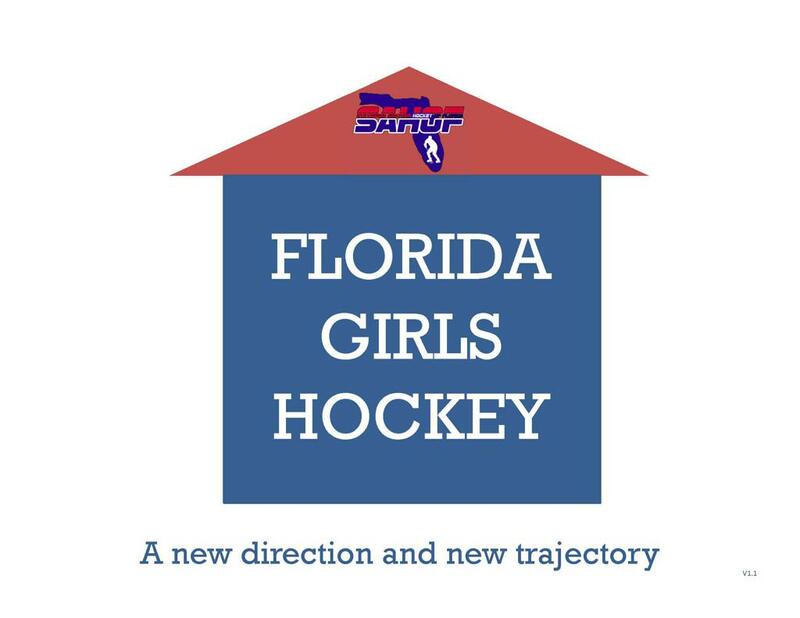 The girls learned about the past, present and future of girls hockey in Florida. June 16 - the road show continued in a presentation to the Florida Women's Hockey League Annual meeting in Winter Park. 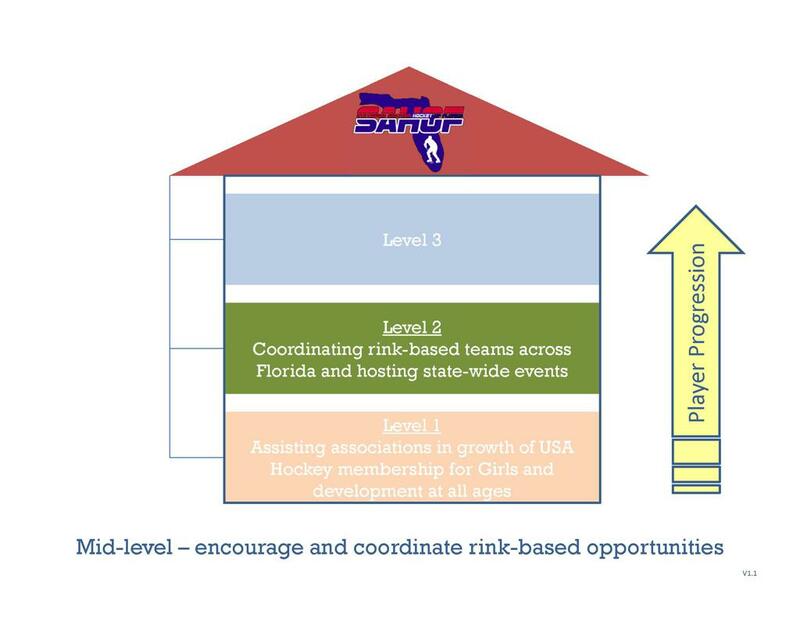 We presented the overview of the program and showed how the sustainable future of the FWHL will in part be determined on the future of growing the girls game in Florida. The women's team expressed interested in supporting and Florida Girls Hockey will look to align with the FHWL season schedule so some girls events can take place in conjunction with the FWHL tournaments to bring resources together. June 17 - Florida Girls Hockey was unveiled to parents and players at the first tryout for the Florida Alliance Girls 12U team at Skate Zone in Lake Worth. August 18 - Florida Alliance Girls 14U and 16U National bound teams began their season with their first team practice at RDV Ice Den. August 25 - Florida Alliance Girls 12U Elite team held their final round of tryouts at RDV Ice Den and selected players for their 2018-19 team roster. October 6/7 - Celebrate IIHF Girls Hockey Weekend by attending a girls hockey event at your local rink. October 20 - Breast Cancer Awareness at Ellenton Ice. Florida Alliance Girls 12u and 16u teams practiced and in the showcase event the Alliance 14u team played the Gulf Coast Flames Peewee A team. January 2019 - The Florida Alliance Girls 12U team will be the host team for the inaugural Mrs Hockey that will be held at Florida Hospital Center Ice. 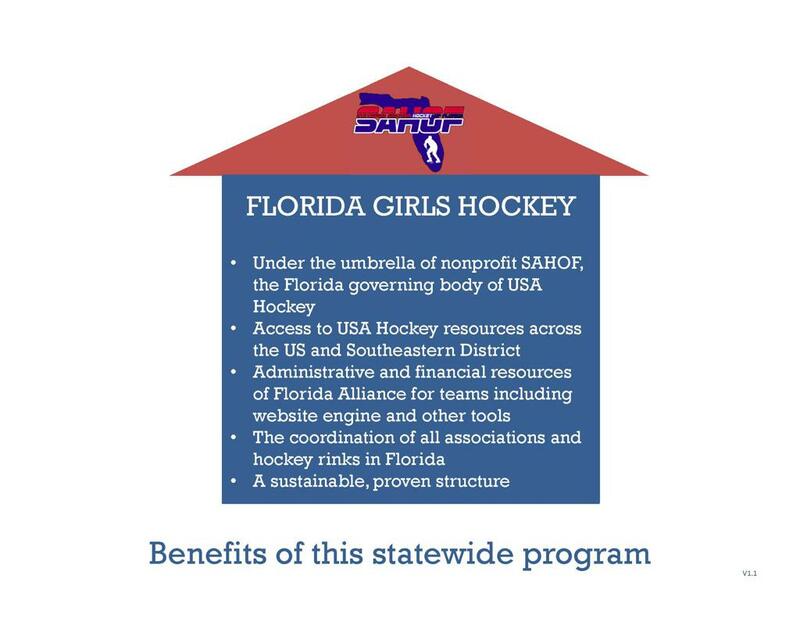 If you would like to hear more about Florida Girls Hockey, or participate in a presentation about this program, please contact Jeff Novotny at JNovotny@sahofhockey.org. 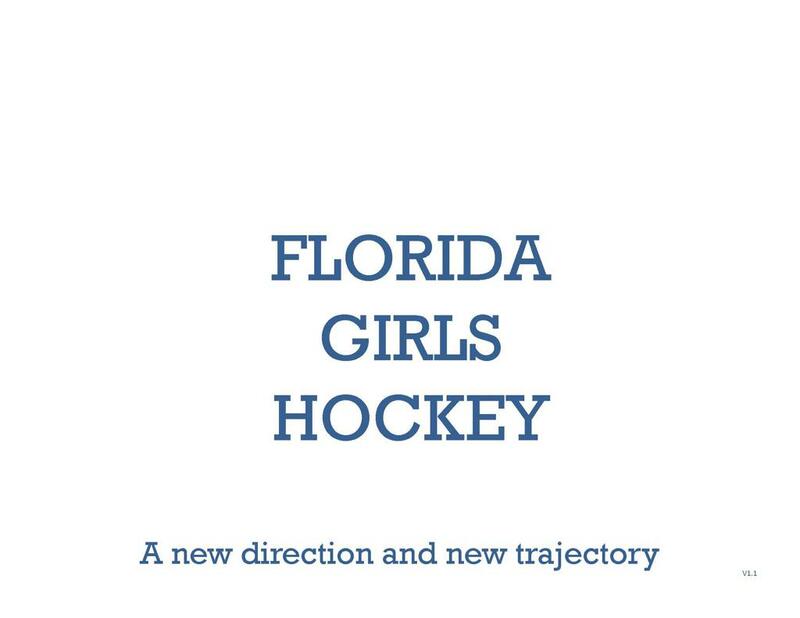 What is Florida Girls Hockey? 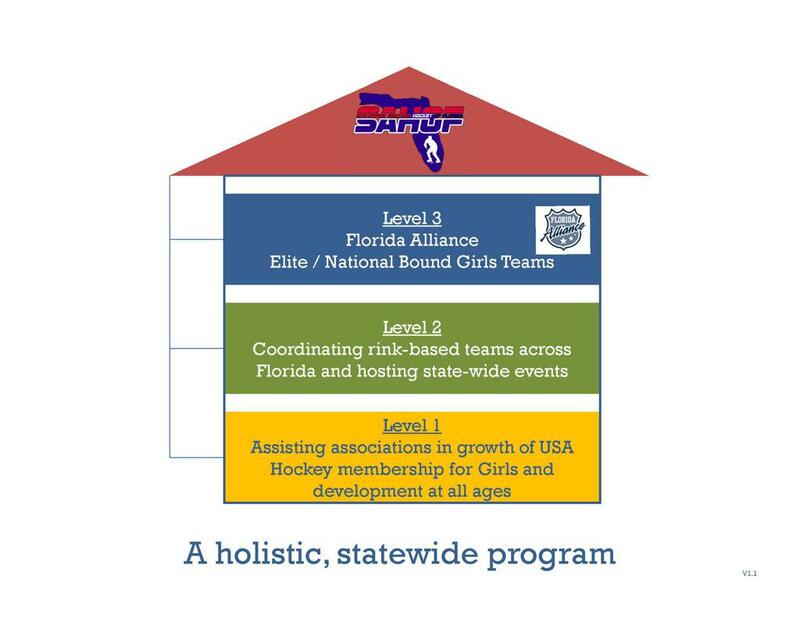 There are three levels of focus for growing the number of girls hockey players in Florida, expanding their development opportunities, collaborating with rinks and associations to create more intra state teams and development opportunities, and a set of elite/National Bound Girls teams under the Florida Alliance program. 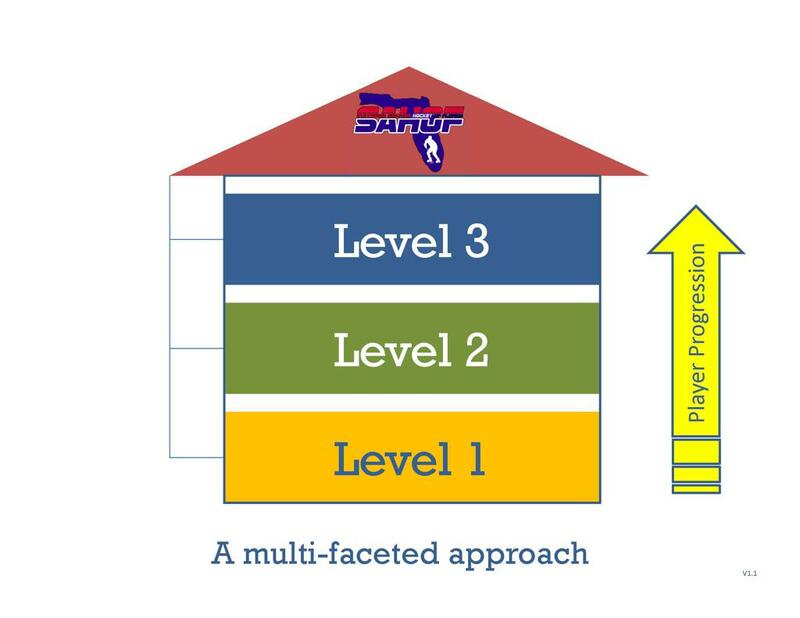 The images below show how the program and these levels are structured. Calling All Coaches Willing to Support Florida Girls Hockey!! The success to any hockey program lies with the quality of their coaching staff. 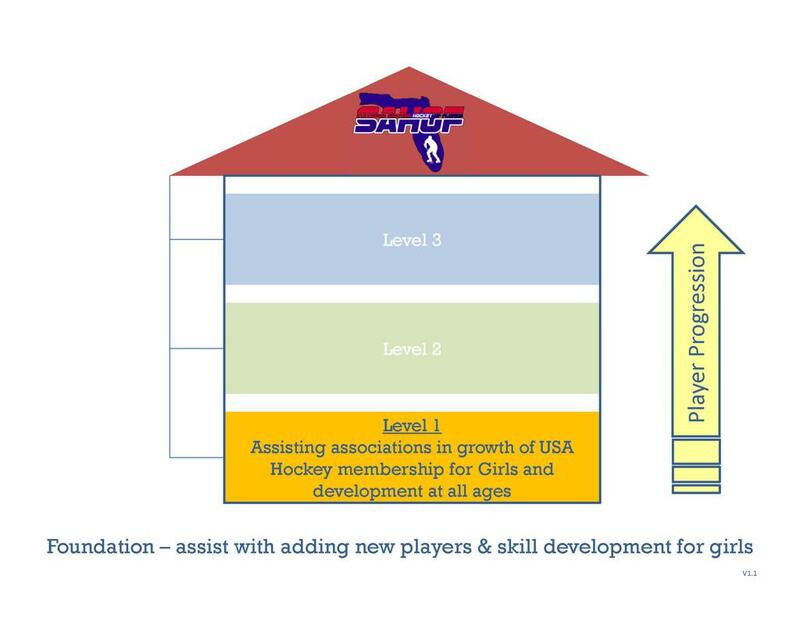 Since our Florida Girls Hockey program has multiple levels and is a statewide program, we are looking for the best coaches from all over Florida to support us in our mission to grow the game for girls and provide them as many opportunities to play as possible. From learn-to-skate training support at each rink/association, to being a practice/bench coach for an in-house/rec girls team at your local rink, to supporting or Florida Alliance Girls teams as a rostered coach or skills/off-ice trainer, we are looking for you! One of our long term visions is to build a sold team that includes female coaches who work with girls to provide them both the skills as hockey players, but also as female athletes and female leaders beyond athletics. If you are interested in joining our team, supporting girls as a coach and adult mentor, please complete the coaching application by entering information in this online survey courtesy of SurveyMonkey. Please only complete the application one time. If you need to make a change after submitting the application, please forward an email to the address listed below. To streamline your completion of the online application, below is a PDF file with the application questions so you can review prior to completing it online.